This end table is made from select hardwoods and oak veneer in a rich dark brown finish. 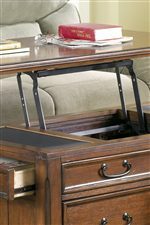 This end table features one drawer with dark bronze colored hardware and one shelf. This piece is perfect to accent living room furniture as well as use for a lamp, decorative items, or storing items. The Woodboro Rectangular End Table by Signature Design by Ashley at Beck's Furniture in the Sacramento, Rancho Cordova, Roseville, California area. Product availability may vary. Contact us for the most current availability on this product. Case Detail Clean lines and inlay panels. Drawer / Shelf Construction Framed drawer fronts and sides. Drawer Suspension Felt drawer bottom on select drawers. 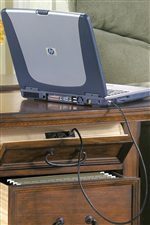 Description: Top Half the tops pulls out to reveal lap top or media storage. The Woodboro collection is a great option if you are looking for Traditional furniture in the Sacramento, Rancho Cordova, Roseville, California area. Browse other items in the Woodboro collection from Beck's Furniture in the Sacramento, Rancho Cordova, Roseville, California area.